Basseterre, St. Kitts – St. Kitts and Nevis’ Prime Minister the Honourable Dr. Timothy Harris addressed a gathering of police officers, their families, and well-wishers from the community on Saturday night at Government House where he declared Police Week 2017 open. The week of activities was reintroduced in October 2016 after a noticeable absence for several years. On Nov. 25, Harris, who is also minister of national security, asked the audience to please stand and recognize the brave men and women who serve in the security forces as a show of tribute. “…Say to the person next to you that you do appreciate the good things that they are doing,” Harris said, smiling. Indeed, the security forces have been doing a great deal. This year, the Ministry of National Security has seen a dramatically stepped-up operations tempo by its forces, with intensified joint operations involving all agencies of law enforcement now a permanent feature of the national security response system. As a result, more vehicle checkpoints, stop-and-searches, as well as searches of abandoned properties (including derelict vehicles) and lots are taking place throughout the federation. More search warrants are also being executed. There is a lot to smile about, as there has been a sharp decline in serious crimes and a marked improvement in their detection this year. At a press conference held three months ago, Commissioner of Police Ian Queeley shared crime statistics recorded up to Aug. 22 and compared them with the same period in 2016. The statistics showed a sharp overall decline in serious crimes reported in communities. Homicides had dropped by 22 percent, attempted murder by 38 percent, shooting at with intent by 29 percent, and grievous bodily harm registered a decline of 9 percent. What’s more, the homicide detection rate more than doubled, rising from 17 percent to 38.9 percent. The rate of detection for attempted murder improved to 55.5 percent from 27.5 percent, and the detection rate for shooting at with intent increased from 11.7 percent to 41.6 percent. The amount of illegal firearms seized this year as compared with last year has also increased: 36 were seized in 2016 and 42 illegal firearms have been removed from our communities as of mid-November 2017. “When we find illegal firearms, we do the ballistics immediately [to link the guns to violent crimes] and we are seeing some important results coming out of that,” Andre Mitchell, assistant commissioner of police (ACP) with responsibility for the Crime Directorate, told the press unit in the Office of the Prime Minister on May 15 with a smile in his voice. A lot of smiles were exchanged last Saturday night during the Police Awards Ceremony in Recognition of Long Service and Good Conduct at Government House. It was the third such ceremony held under the present Police High Command. Prime Minister Harris announced the new makeup of the Police High Command during a radio and television national address last year on Feb. 9. 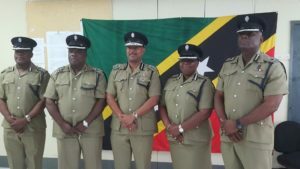 The police awards ceremony, which had been inactive for eight years until it was reintroduced last year, recognizes officers who have served in good standing in the Royal St. Christopher and Nevis Police Force for at least 18 years.